This large-headed bird has a long, pointed black bill, short legs and a square-tipped tail. Its distinct crest is bushy, and blue-grey above a white collar, while its body is the same dark blue with white spots on the tail and wings. It breeds across much of Canada, most often sighted around lakes, rivers and saltwater estuaries. My name is Owen and I am 8 years old. My faverote bird is the kingfisher because they dive strait down into the water to get a fish. We have a lot of lakes in Canada and the kingfisher it the king of the lakes. I think the kingfisher would show how strong Canada is. Love the Belted Kingfisher for its cartoon-like look, diving antics & fishing acumen. Wonderful bird. I chose the belted kingfisher becuase it was on the five edoller bill. It makes very nice sounds and has a beautiful head crest. It has a beautiful face and crest. And it also lives by the seashore. Although the Belted Kingfisher is a small bird in stature it always gets your attention when in flight or hovering above the waters looking for it's next meal. It's distinct sound is one that when once recognized you will remember. It is often heard long before you get a visual sighting and watching it chase its fellow mates and make it's chattering sound is a real pleasure to experience. Did you know that Canada is having a vote for its national bird? Well the bird I think that would best represent Canada is the Belted Kingfisher. Its diet is consumed of mostly small fish and insects, occasionally eating frogs, tadpoles, mice, rodents, lizards, small snakes and small birds. The Belted Kingfisher should be Canada’s national bird because it’s strong, it used to be on the old 5 dollar bill, it can be found throughout Canada, and lives on the coastlines much like the first people of Canada. The first reason that I think the Belted Kingfisher should be selected as Canada’s national bird is that it used to be on the old Canadian 5 dollar bill. In 1986 the bill featured Wilfred Laurier on one side, but on the rear of the bill there was a description of the Belted Kingfisher and its habitat. If the Kingfisher was important enough to be on our currency then it is important enough to be our national bird. Another reason is that it is a very strong bird for its size. The Kingfisher will plunge face first into the water to retrieve a fish then knock it unconscious before eating it whole. This symbolizes Canada because our country may not have the biggest army but our forces are brave and will “dive in” to help others. My third reason to prove that it should be Canada’s bird is that it can be found throughout Canada. 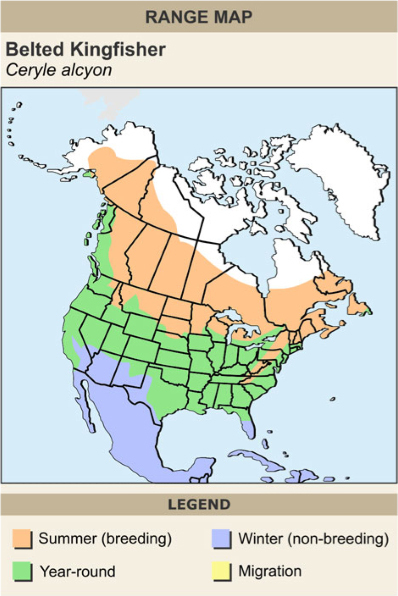 The Belted Kingfisher can be found through different parts of Canada during different times of the year. Therefore because they are so visible throughout the country, they cannot be forgotten easily. An additional reason is that the Kingfisher requires both land and water for survival. It will dive into the water to retrieve things such as small fish, aquatic bugs and crustaceans, therefore making most of its living from the water while it still lives on land. Canada is very well known for its natural resources-- fresh water and lots of land. 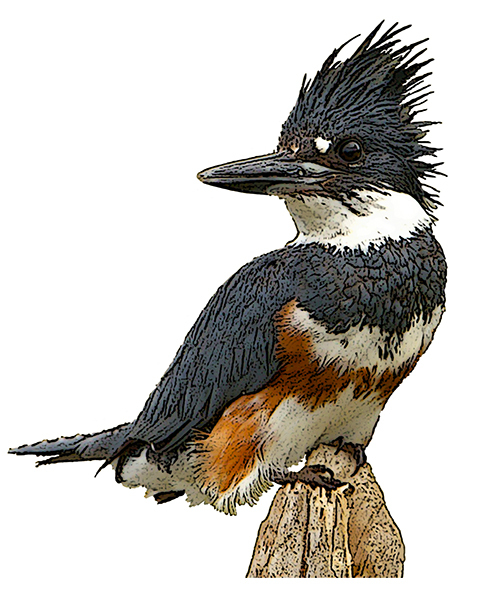 Lastly, the Belted Kingfisher lives by lakes and along the coastlines. They rely on water for survival so that they may fish for food, however, when the water freezes they must move to warmer areas where the water is not frozen. Their willingness to adapt is much like the first people of Canada who understood that survival depended on adapting. A symbol is something, often an object, which represents something else. It has significance and is chosen with care. The Kingfisher has history, strength, is visible and has a strong connection to the land. It reminds us of our past and our relationship with the land much like our ancestors. As humans, we rely on the environment—both land and water, for survival which the Kingfisher embodies. Therefore, the Belted Kingfisher is the ultimate choice for the national bird of Canada. Hey, it still says "5 bucks" to an expat Canadian. Being an amateur photographer i know first hand how tough it is to capture a picture of these beauties. It's Canada's secret treasure. The loon is already featured on our coins.. the Kingfisher is indeed a Canadian icon. What can I say? I observe this bird frequently from my office window. It is a really interesting species and looks cool. What more reason do you need to be Canada's National Bird? I voted for the Belted kingfisher because it's easy to identify by it's bright colours and it's big head.It is super friendly.It lives all around Alberta.In sumer they are in Ontario. These kingfishers are powder blue above with fine, white spotting on the wings and tail. The underparts are white with a broad, blue breast band. Females also have a broad rusty band on their bellies. Juveniles show irregular rusty spotting in the breast band. This bird is feisty,beautifully coloured,covers most of Canada.Where does the Kingfisher go when there is no open water,like in winter? I do not really know much about this bird's lifestyle. Where does it nest? Does the female look the same as the male? I wish your survey would mention how much of a Canadian bird this is. . Is it found in other Countries as well? I choose the snowy owl. It has true Canadian colors unlike some other animals. Its also really beautiful. Although the loon has been ours for many years I think we need a change! i choose the Belted Kingfisher not only is it found Canada wide but the ability it has to dive in and catch its prey. which is symbolic to the way Canada dives in and helps other countries and nations in the time of their need. The kingfisher is a strong, feisty bird!!! There is nothing like the moving swooping call of the belted king fisher in the summer. The Kingfisher was on the $5 bill and always makes me think of home. I see them regularly on Gabriola Island and Ontario, when I visit there. They are a regal, Canadian bird. To see one is to love one. The Belted Kingfisher is a flashy little bird that has successfully fended for itself in a variety of habitats. It is land based but "makes its living" (diving for its food) in the water. This combination of "land and water" is representative of our great country, Canada, which is very much composed of land and water. The kingfisher is a fascinating bird, and I often see it thriving on the wild rivers and lakes of Ontario. I'm sure if I was on a wild winding river elsewhere in Canada, I would come across one hovering motionless over the water's surface. A bird like the loon already has celebrated national recognition, but we thrive because of a whole ecosystem of animals. Why not give this great little Canadian avian some recognition. Ok, I think kingfishers are beautiful birds, but I don't see them in Toronto, or in Whitby where I live. Or in Oliphant/Wiarton where I spend a lot of time. So I'm picking them because I love them, not because I know how many there are in Canada. I would pick the Canada goose for familiarity, and see tonnes of them in Whitby and at the cottage. I love watching their huge V formation. Loons? I love loons, but would that be a vote for wealthy Muskoka cottagers? Would that be the high end fave bird? I do like the appearance of the common whatzit, with its elegant neck.